Noah: Why do you love me? Erin: It’s hard to pinpoint in just a few words. Noah: Is it because I’m useful? Because I do laundry and the dishes? Erin: No, you’re not that useful. Erin: I love you in spite of all reason and against all odds. Today is our four-year anniversary. We got married in the little, pastoral town of Franklin, Tennessee, where a preposterous number of country music stars and various celebrities live (and no, we didn’t see any. In fact, I didn’t see any the ENTIRE TIME I went to school in the ritzy part of Nashville. I really can’t explain it.) The day was beautiful — just enough clouds to be pretty, just enough breeze to be pleasant, and no humidity. I took that as a sign of The LORD’s blessing on our union. If you think we looked rather young, it’s because we were rather young. My 21st birthday happened on our honeymoon at Disney World. 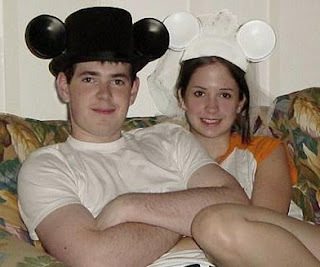 And no, we did not wear the ridiculous Mickey and Minnie bride and groom hats with ears. Um, I can explain that. People do all kinds of inappropriate things behind closed doors on their honeymoon. Though not all have a photo record. We did get some free stuff though. Some kind strangers even paid for our drinks on my birthday. 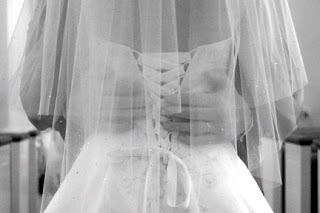 In fact, I believe God truly approved of the marriage, because an angel visited us. Disguised as a Disney World employee. It was my birthday, and we were trying to get dinner at the English pub in Epcot Center, but ALL the restaurants were booked solid. We were trying to figure out what to do, when suddenly a woman dressed in a flowing skirt with a Disney World name tag randomly appeared, asking if we needed help. We told her the situation, and she said “Wait right here.” She came back with a wait-your-turn buzzer from the pub and asked, “Is 7:00 OK?” It was 6:45. And then the heavens opened and a light shone down over her, and a dove landed on her shoulder. Though it may have been a pigeon. Before we could utter a thank you, she had disappeared behind a door that miraculously appeared in a wall. And that was our encounter with a holy seraph. Let the people say Amen. Four years ago I wouldn’t have imagined that we’d have a house, a dog, two cats, and a baby by now. I also wouldn’t have guessed that Noah would be a police officer. I must admit that life is pretty good, but there are definitely stresses to being a police wife. Like worrying when he doesn’t answer his cell phone. The long hours. The too-many nights and evenings and weekends home alone. The working holidays (Thanksgiving AND Christmas this year). And, as an added bonus, he has to work tonight — he can’t request off, because it’s a re-certification training. But I’m proud of him. I’m proud of his choice to serve in this way. I’m proud of his courage, his strength, and his skills. I’m proud that he can walk into a situation that’s terrifying for someone, and immediately bring calm and a feeling of safety. I’m proud that he wanted to marry me. And I don’t think it’s solely because I told him I was an heiress. I love you, Noah. Let’s try for an even five years before calling it quits.